Fast set shower and bathroom sealant, ready to use after just one hour. Stops mould growth and fungi. Evo-Stik Trade One Hour Sanitary Silicone 290ml Clear is rated 4.8 out of 5 by 11. Rated 5 out of 5 by l4urence from Perfect - dries quick Used other brands which needed days to cure properly - this is ready to go in an hour! Worked really well! Rated 5 out of 5 by diymostthings from Superb product but extra care needed! This particular silicone product is a "rapid set" version. This is very useful when the sealed job needs to be put back in use quickly, but a word of warning - it does skin over very quickly. I found that sealing around a double drainer sink on the worktop took about 2 minutes to apply and then a further 3 minutes to tool to a uniform finish (I used masking tape to get good edges). As I completed the tooling I noticed that the bead was getting very stiff - another minute and it would have been not really toolable so I was lucky to get a good finish all around the bead without needing to go over it in places. It was fully set and the sink re-useable in roughly 45 minutes (temperature of the kitchen was 20 deg C). Rated 5 out of 5 by John one from Brilliant Bought 2 to seal shower unit,went on very smoothly and was ready to use in 1 hour. As shower is in difficult position had to use more than usual but no problems. Rated 5 out of 5 by stevensquirrel from Does what it says on the tin! 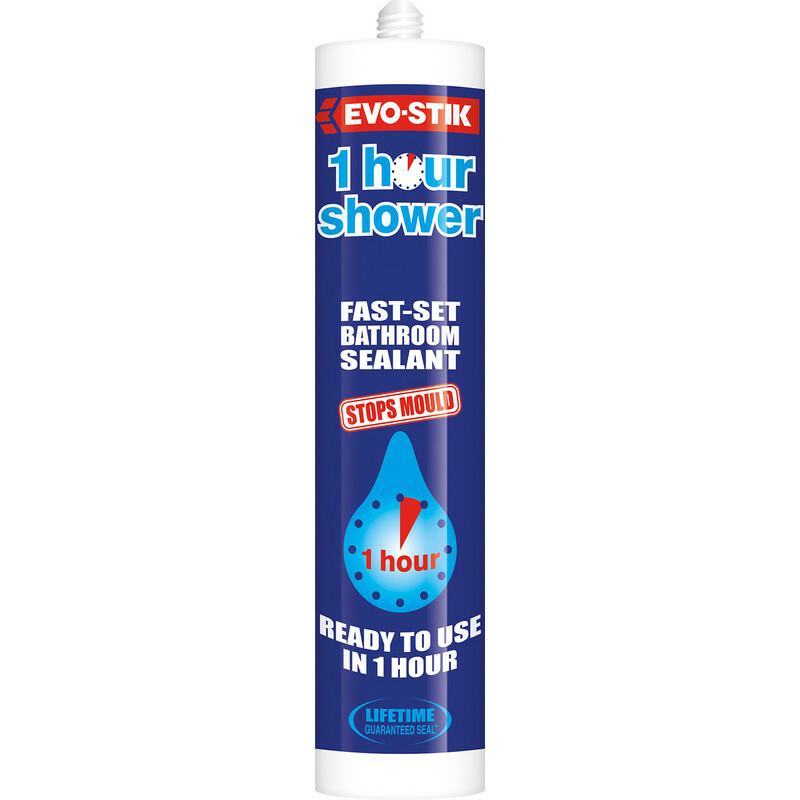 Really does go of in an hour or so, great for emergencies or when you can't be without bath/shower/basin for 24 hours waiting for standard silicone to set. Rated 5 out of 5 by DaveCh from Great fast drying silicone sealant Great item, fast drying as it says 'on the tin' needed this feature as my family can't manage any 'down time' on our shower!